Rajinikanth Film Review From Maapillai. Maapillai Movie. 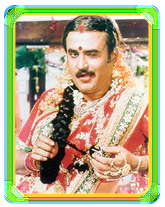 Rajini Film Maapillai. Rajinikanth Maapillai movie. www.rajinikanth.com. Aarumugam(Rajnikanth) makes a blazing entrance, gatecrashing a marriage to abduct the bride. Geetha (Amala), the bride's friend, gets him arrested but then learns that he had rescued the girl from a forced marriage. Further revelations about him (he is a gold medallist, has a good heart, etc.) make her fall in love with him. After some convincing, Aarumugam reciprocates too. Meanwhile, Aarumugam's sister is in love with the son(Raja) of a rich woman Rajarajeswari(Srividya). When Rajarajeswari learns of this, she foists a false case on her and puts her in jail. It is then that Aarumugam has his first encounter with Rajarajeswari. He then learns that she is none other than Geetha's mother. He marries Geetha against her mother's wishes. Rajarajeswari vows to separate Geetha from him while he vows to prevent that and make Rajarajeswari understand that love and affection are more important than money. The one-on-one confrontations between Rajnikanth and Srividya are the highpoints of the movie and each of these has been handled superlatively. Rajnikanth bristles with energy during their meetings and Srividya is suitably haughty and hits all the right notes. Their first encounter in her house, their private conversation immediately after the wedding and their talk in the garden before the climax in the house all reveal excellent execution by the director. The final moralistic talk Rajnikanth has with Srividya before she is deserted by her near and dear also contains some nice points about love and affection without going overboard. The attempts by Srividya and gang to undermine Rajnikanth are also fairly interesting. Ofcourse we know the outcomes but the plans are not so childish as to make the entire process obvious right away. The exact way Rajnikanth is going to foil a couple of the plans does offer some suspense. But Amala exhibits an alarming tendency to switch her allegiances in these portions. All it takes is one hint of misconduct for her to suspect Rajnikanth before calming down and hugging him after his name is cleared! Her character could definitely have been drawn up better. The comedy of Vinu Chakravarthy and S.S.Chandran seems like a miscalculation. Suspension of disbelief becomes extremely tough when Pakkirisami (Vinu Chakravarthy), who comes out of jail, is said to be Srividya's brother and Srividya swallows his story about his being a millionaire, to allow him and S.S.Chandran, his buddy, to stay with her. Their past history enables S.S.Chandran to makes some wisecracks about jail but one wishes they had been brought into the story in a different way. Just as things start to get monotonous with Srividya's plans and Rajni's counteractions, Jaishanker's introduction as Srividya's ex-husband spices things up. But surprisingly, the reason why Srividya split up with him is never mentioned. There are some patches of conversation which say he left her because of her obsession with money but a little more background on their past life would have made the proceedings more interesting.